Text: Mike Sullivan this multi-talented person directs movies, shoots photos and has also curated exhibitions. 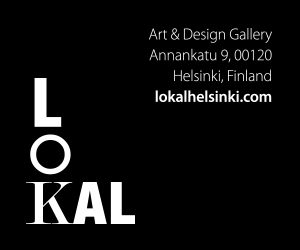 He has regularly exhibited in Finland and in Europe as well; his films include documentaries and experimental short movies. His work pushes the boundaries of the media industry and reflects a talent on the forefront of the digital age, a recent project involved skype and the changes in data rates during an online conversation, for Self-Portrait he photographed every single item that he owns and he questioned it too; ‘how do I construct myself through my consumption, what do the things I own say about me?’ We caught up with him to see what he has been up to recently and hear his thoughts on Helsinki. I’m Timo Wright, a media artist and documentary film director from Finland. I just finished a really big and difficult work called “A Feast with King Midas”. It’s a video work where a man sits at a table full of food and slowly the food starts to rot away. We used time-lapse cameras and the shooting took two months. It was quite a mess! Currently I’m working on a piece about commercial flying. I think there isn’t any typical day for me but I try to work typical work hours, or a bit more. A big part of a work day is just emails, meetings, research etc and not so much “making art” in a typical way. Helsinki is a great, quirky city with lots of hidden gems and nice people. There are some really interesting things going on, street culture, events, parties, locations. Ask around and there’s always something going on. If you are in town at the right time, Restaurant Day is definetly a must-see. Four times a year hundreds of temporary restaurants open for one day, its massive and its going global now. In the summer, the old harbour area Kalasatama, is a great place to visit. Graffiti walls, debris, a cafe in a cargo container and the Container Square with out-door gigs, etc. Kallio Kallio is the most interesting area to see, with a wide spectrum of people and establishments. Kallio-movement is doing great stuff, check if there’s something for your liking. Otherwise, the public saunas such as Kulttuurisauna, Arla and Hermanni are great and it’s worth visiting the some of the suburbs (Itäkeskus is a nice place to start, also Mellunmäki) also for another kind of Finland. Bar-wise, Corona is a great old place still going strong and party owned by Aki Kaurismäki. Kallio is full of nice bars, just try your luck. Ääniwalli（Pälkäneentie 13, Helsinki） and Kuudes Linja club-wise are good picks. For a cheap lunch, check out Kasvisbaari with the art students, Lemon Grass(Kolmas linja 12, Helsinki, Finland) for great Thai and Hoshito for the best Japanese in Finland. Next to it is one of the nicest bars in town, Magneetti（Mäkelänkatu 20 B 00510 Helsinki）.